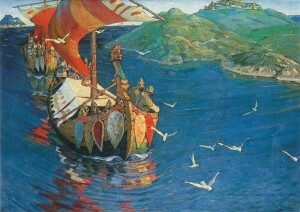 May 8th is International Viking Day! Lycklig Internationella Vikingadagen! Lycklig Internationella Vikingadagen! In case you were wondering, that’s Swedish for Happy International Viking Day. Swedish tradition and culture is a huge part of my life. Both my parents and grandparents were from Gotland, Sweden so my Swedish roots run deep. I have been immersed in Nordic culture since childhood so when it comes to Vikings, those roots run deep too! As “Valli the Viking” I’ve had the pleasure of attending Viking Camp several times during my many years of traveling to Gotland to visit family. So this is the perfect occasion for me to bang me shield, raise me Viking banners and insignia and spread the joyful message that the Vikings have reawakened! Here are some fun ways you too can play along and celebrate Viking Day with me! Let’s go on a Viking-inspired field trip! Have you ever wondered what it would be like to live as a Viking? Well wonder no more. Every summer we go to bonafide Viking Camp. A few years ago my son had the most amazing experience. Here’s a look at his adventure back into the Viking Times. We were just out walking, my mom and I, when we came across an old carved stone. There it was just standing out in the field. “Mom, do you know what this is for?” I asked. “Can I touch it?” I asked. But my mom wasn’t there. I started running through the field from the direction we came only now there stood a large wooden house. I didn’t remember seeing it before but I was sure my mom had to be in there. As I approached the door I could see blue smoke. What was that? It was very dark in there and all I could make out was a fire and some furniture. Entering the hall, I realized that this was a Viking long house, where the Viking chief and his clan would eat and celebrate. I had read about it in my Viking books. I was the only one in there. Where was my mom? Suddenly, there she was; a very kind looking woman baking bread on a hot iron pan. She was dressed in clothes from a different time period. She wore big brass pins to hold up each side of her dress. On her head she wore a headscarf and turned her bread with wooden spoons. It sure smelled good. I decided to have some and afterwards I would look for my mom again. As I was eating a loud horn was being blown and then loud shouting. As I turned around, I saw a man running out to the center of the field and someone was chasing him. Soon swords were clashing and shields were being butted against each other and held up to stop the crashing blow from the flying swords. They too were dressed in clothes I had never seen before. It didn’t take long for either one of them to be disarmed. Both were very good swordsmen. The fight wasn’t over, however. Once they were both free of swords and shields they started wrestling. They kept flipping each other until one of them could no longer get up. The men who had been fighting were now lending a helping hand to get up, hugging each other, and laughing. The young woman who had baked my bread was clapping and laughing as well. I didn’t know what would happen next. It was all so odd. Somehow between the barley bread and the sword fighting I realized that, though I was in the same place, I wasn’t in the same time. Could it be true that I had somehow ended up in a Viking village in Viking times? Following a group of boys and men, together we arrived at a Games Course. Inside were a variety of games, archery, axe throwing, tug of war and log tossing. As I walked in, there were two people sitting on a log, hitting each other with pillows until one of them fell off. All of the boys around my age were brought into the center of the arena and the men who had been fighting were standing before us. “Can anyone tell me what this is?” I asked. “A spear!” came a shout from the back. Next up was the axe. A Viking always carries a bow, axe, shield and sword. They even sleep with them near their bed because invaders especially like to come at night. I learned that there are two kinds of swords. The ones the Vikings make themselves, which are very much lighter, and the ones that they acquire on raids. These are heavier metals and have rounded hilts (handles). I also learned that shields are a swordsman’s best friend. There are a couple of ways to use a shield. One use is to join a friend’s shield with yours and hold them together.Another use is to bump into an opponent’s shield, knocking them off-balance. The lessons suddenly turned serious when we came to the topic of chainmail. Only the very rich could afford chainmail as body armor. One piece of chainmail costs about 200,000 dollars. Much of the metal needed is gathered on raids and then re-purposed for chain mail. It is extremely heavy but absolutely protects from a sideways blow of both axe and sword. “Thank you young brothers,” shouted my companion. “Now it’s time to go off to your other courses. We will see you this afternoon for games practice.” Leaving the games course, we walked into a small wooden village where we were divided into small groups which would rotate through various daily tasks. First it was leather making. Everyone had to make their own shoes. Both men and women make shoes for children but once you are 10 years old, you are expected to make your own. Each village and clan makes their own beads by melting sand into glass. You can tell where somebody comes from by the beads they are wearing. Bigger villages become trading centers for smaller villages to swap items they have for items they need. Many times beads are used in the exchange. This village has a large assortment of beads from all over the Viking world. I traded a leather purse I had made for the prettiest beads so I could make my mother a necklace. Another daily task is gathering flax and wool to weave into rugs, blankets, and clothing. Using various flowers and herbs, we made our own dyes to color our newly spun wool. My favorite color is the yellow which comes from dying birch bark. An entire small wooden house was made for textiles and weaving. Among the other houses for doing chores were blacksmithing and iron making, pottery with clay we gather from the sea, wood carving, and the board game house to teach strategy. No matter how many tasks there are to be completed in a day it always comes back to one thing and that is be ready for an attack by raiders.Much time is spent in forging swords, making shields, and bending metal for chainmail. Ironically, I found this to be a peaceful task. While I would bend the metal from one link to another, I could hear children playing, women talking, and the sound of birds and the breeze blowing in the grass. In the distance is the sound of the sea crashing against the shore. In the late afternoon, when the shadows are getting long, a horn blows in the distance. It’s time to suit up for the afternoon games. It’s a time for much “play” fighting, arrow shooting, axe throwing, wrestling, log tossing, and shield butting. Though our teachers make mock sword fighting look so easy, it is very difficult. At home I can really move my wooden sword around very fast. It’s another story when the sword and helmet are made out of metal. Add chainmail to that and I’m not going anywhere fast. In fact I can barely hold my head up and my shoulder aches to even hold my sword up for more than a couple of seconds. Wow, I didn’t know that was a Viking saying.. I ran through the gate and towards my mother’s voice. When I got through the gate, the village disappeared. “Omi, wake up. It’s time to go,” I heard my mom say. As I opened my eyes, my mother was folding up the picnic blankets next to the Viking stone we had found. Walking back to the house I felt something in my pocket. I reached in to feel the beaded necklace I had made for my mom. Had it really been a dream or had it really happened? P.S. A few summers ago my son and I spent our vacation on the island of Gotland , in Sweden. Everywhere you turn on the island you can find evidence of the Vikings. The largest Viking hordes have been found on Gotland, one in particular was found by a school group touring an old Viking village. We would like to thank Annie and all of our friends at the Tofta Viking Village . They run an incredible program of Viking camps, long house feasts,and sharing their love of the Viking world with us modern people. 1. Check out this complete list of Norse runes and their meanings HERE. Interested in learning more about Norse mythology? Go HERE. 2. Even though in Runemarks, Thor has lost his hammer, we still know it exists. And he’ll need it back eventually so lets help him out by making our own Thor Hammer! 3. Idun is the goddess of healing. She heals the sick, wounded and dying, with her dried apples—the food of the gods. Make your own healing fruit! Another thing that has been inspired by Sweden, Gotland and Viking lore is my children’s picture book, Dragons Are Real. 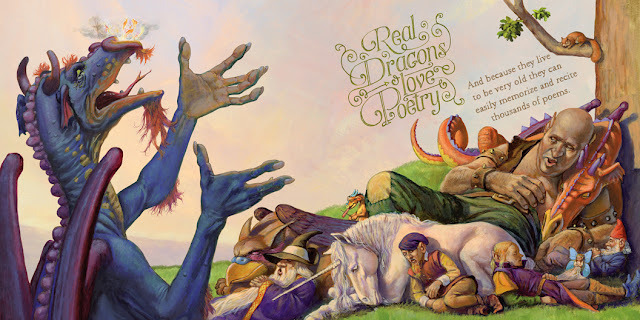 This “fairly true” book came to life last year and is inspired my my childhood friendship with a real live dragon! Though many Vikings believe that Dragons are fierce beasts (maybe some are) the dragon I encounter was not like that at all. What makes my book Dragons Are Real book special is the idea that the fiercest beasts in known history or imaginations everywhere could actually be the best of friends. It’s a lesson in finding companionship in the most unusual of places. 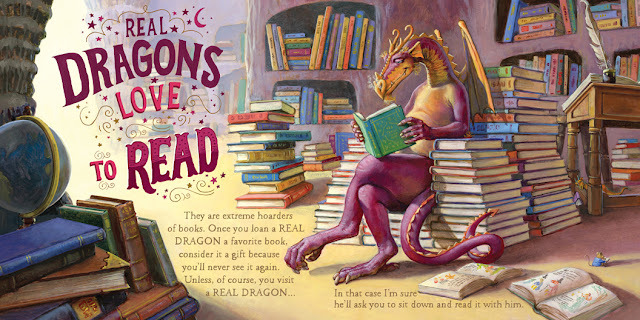 Readers will also learn things about dragons that might not be common knowledge such as they are master of disguises and how they love sugar and sweets (at unacceptable levels) and will do anything for treats. Grab your copy by clicking the pink heart below.